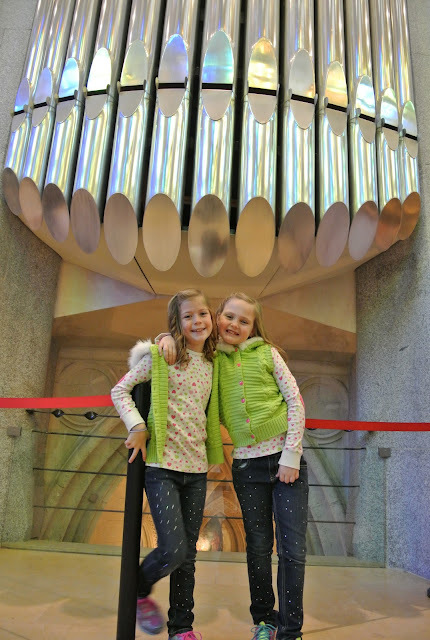 Mediterranean cruise for Christmas… that was our plan! 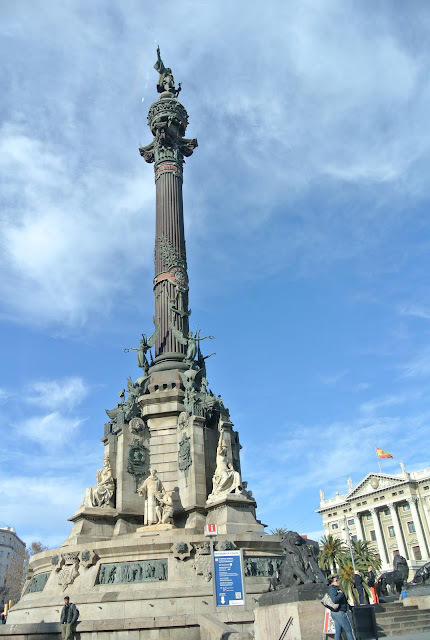 Our first stop and port of embarkation was Barcelona Spain. In San Antonio, we had a hotel taxi bus pick us up and we headed to the airport. I use Airport Express Bus Taxi for groups our size. Ready for a long day of travel we boarded our flight to Chicago with a connection in Frankfurt and on to Barcelona. After twenty-two hours of travel we landed in Barcelona. It was a long flight and we took naps as often as possible but we all arrived exhausted nontheless. My way to fight jet lag is to start right away to adjust to the local time. It was three-thirty local time by the time we arrived at our hotel, Hotel Arts in Barcelona www.ritzcarlton.com/en/Properties/Barcelona. Much to our kids chagrin we made them get ready to go out to see a few of the local sights. I should mention that the staff that welcomed us to our hotel was so friendly, probably the friendliest I have ever encountered at any hotel. Around every corner there was someone to welcome us and when we asked when we needed to checkout, they let us know it was whenever we wanted. Thats my kind of hotel. Another reason we selected this hotel was because we needed rooms to fit our crew and this place had the best accommodations for a large family. Our room was a small apartment with three bedrooms, a kitchen, living room, dining room, and a bonus TV room upstairs. It was awesome, though we knew we were going from our two thousand square foot hotel room to three hundred square feet on the boat! We didn’t have too much time sight seeing in Barcelona on our first night. We started by taking a taxi to Placa de Jaume, www.barcelona-tourist-guide.com. We started off our walk at this plaza and enjoyed the Christmas decor of the city. 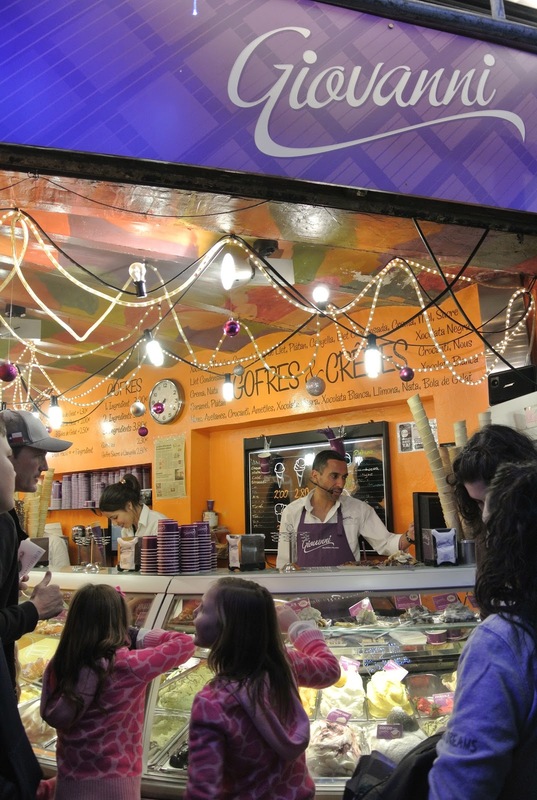 From there we began browsing shops, going to a Tapas restaurant, and onto a geleteria and crepe place called Giovanni’s. There are some great reviews on Giovannis on trip advisor. Luckily we visited the Barcelona Cathedral and saw some of the melted houses designed by Guadi. 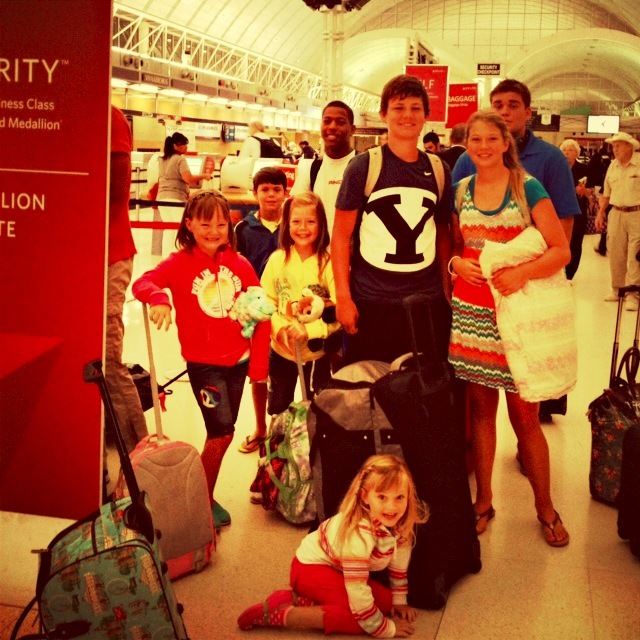 It was a quick three hours but we were ready to get back to the hotel and get some rest. After another two taxis back to the hotel we headed back up to our room. With everyone bathed and in bed we all got some rest. We went straight to bed and promptly woke up at three am. It was hard to get a full nights sleep. Finally back to sleep at six am we thought we would sleep for another two hours and get up for breakfast but that was not the case. Even the little kids didn’t wake up and our little apartment was silent until eleven am!! Having missed breakfast we finally were ready by twelve and headed down for a very nice meal in one the hotel’s seven restaurants called Bites. 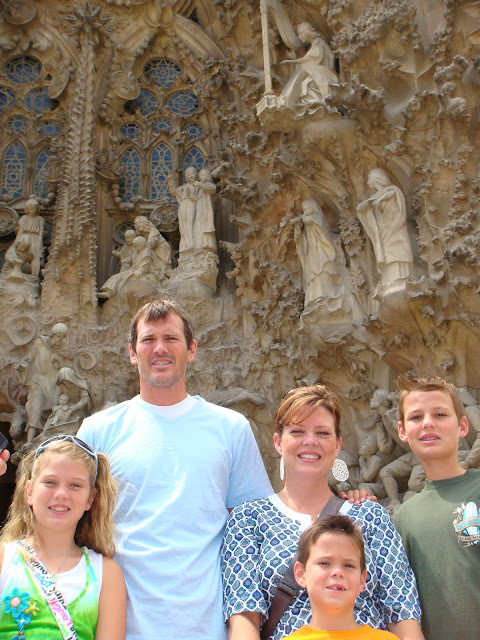 We knew we’d have to hold off on the rest of our travel sites to see until we returned to Barcelona at the end of the cruise. Barcelona feels like an old friend I haven’t seen in awhile but one I can start up where I left off. It may sound crazy but it kinda feels like NYC meets San Antonio. It has the hustle and bustle of a big city with fashion, food, and entertainment but the culture and history of San Antonio. I know NYC has a culture too but I like the old world culture as opposed to the new. In short I could easily make Barcelona a home away from home. I love it there! We only had two days in Barcelona during our stay and that was a crime. I could spend weeks here walking the streets, appreciating the architecture, discovering the little bakeries and tapas restaurants that are tucked into every corner. Being here during the Christmas Holidays was even more gratifying because the Espanolas know how to decorate for the holidays. The streets were adorned with lights making everything sparkle and bright for blocks. Sadly we spent a lot of our first day sleeping since we were adjusting to the time change at the beginning of our trip. 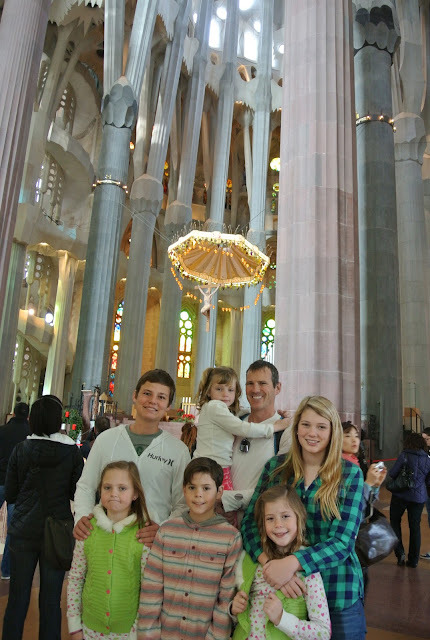 Our last day of our two week cruise was spent in Barcelona as we readied ourselves for our long flight home. We again checked into Barcelona’s Arts Hotel, www.ritzcarlton.com/en/Properties/Barcelona which I should mention is a magical experience. Then we were off to see some sights and create our own adventure. From Hotel Arts we took taxis to Sagrada Familia, www.sagradafamilia.cat. It was about a 7E taxi ride in which I fumbled through a very long conversation in Spanish with my taxi driver. It had started as an innocent conversation about where we were from, how many kids we each had, and migrated into politics, the economy, and how I felt about President Obama. My Spanish ability amazingly kept up with the understanding part but my vocabulary was stunted to only agreement or verdads. It was a funny experience for sure. When we arrived at Sagrada Familia my taxi driver whistled at the size of the line circling the church and then let me know in Spanish again, we would probably not be able to enter the inside, and just to take some pictures around outside. The line really did circle three quarters of the massive structure. I stood in line and began our wait as Trent and the kids walked to the very front to see if we were in fact in the right line. When a guard watching an exit saw Trent with all six kids he assumed Trent was with a school of children, and beckoned Trent over. Soon I received a phone call while I waited in line and Trent told me to come around the the exit and a nice guard would let us all in. School groups are free at Segrada Familia! Finally having six kids turned out to save us the 13.50E each we would have spent buying our tickets, and at least a two hour wait in line. We still aren’t sure how Trent pulled this Jedi mind trick but we were ready for a break. It was a great blessing and I recommend buying your tickets on line at www.ticketmaster.es to avoid the long lines, or getting there early. 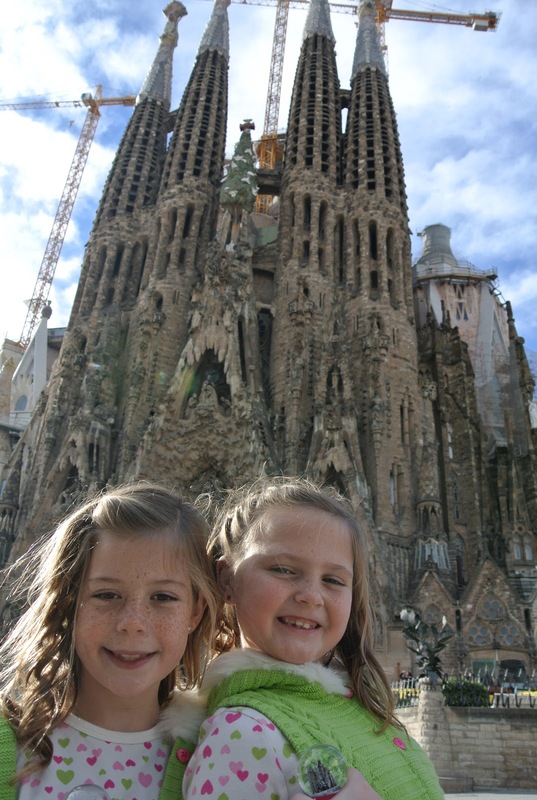 Sagrada Familia is a very old cathedral designed and began construction under Gaudi back in 1882. For the last one hundred and fifty years it has been under construction. When Trent and I brought our three oldest to Barcelona back in 2009 the interior of the cathedral was under heavy construction, and it was hard to imagine it’s grandeur at that time. This trip most of the construction was going on on the exterior and the beautiful inside of this cathedral was on display. 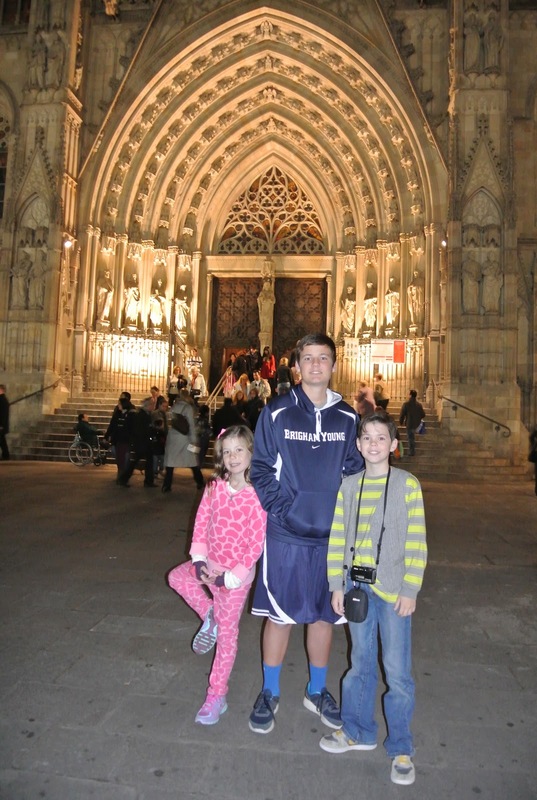 Of course, it was just another cathedral to the kids but by now they were accustomed to all of the photos I take at every location and they smiled for the camera. They kept joking between photos, “quick position one, everyone”, or “okay this time… everyone get into position two”. They were well rehearsed. From Segrada Familia there is a McDonalds across the street which is hard for any child to resist after being out of the US for two weeks. Lexi begged but we couldn’t imagine one of our last meals being at Micky D’s so we kept on looking for a good lunch site. 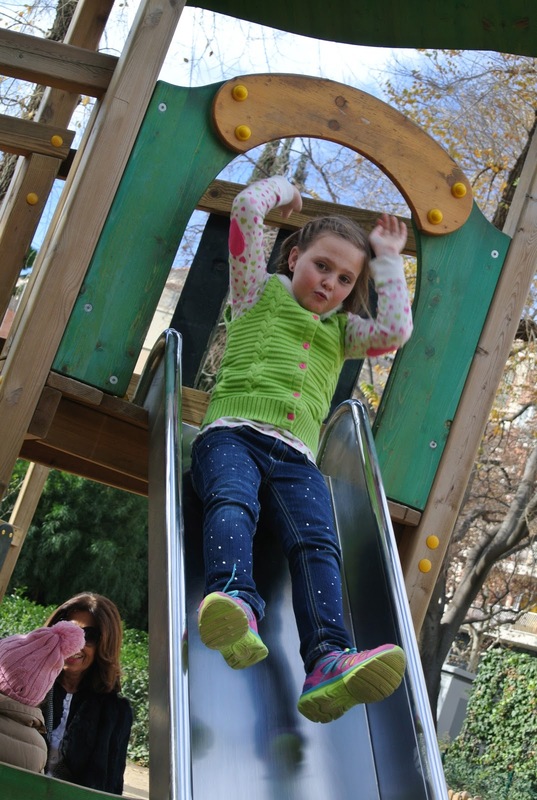 There is also a park across the street from Sagrada and so we let the kids play awhile and run around while Trent and Colton did some shopping for some soccer jerseys at a nearby store. The kids made friends fast with some locals and it was fun to watch them interact with lots of sign language with no cultural barriers holding them back. Our next move was a little bit of a mistake. 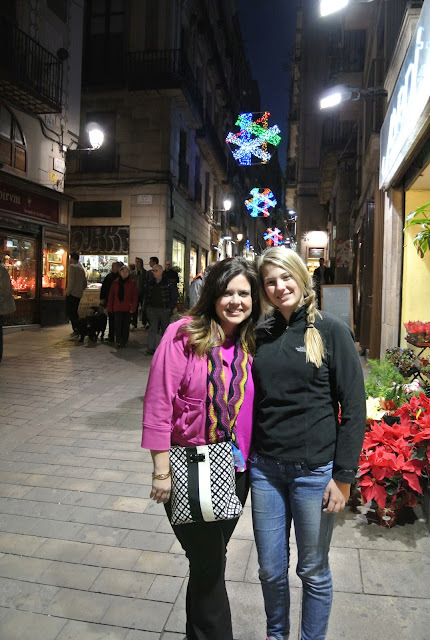 We yelped a good restaurant and knew we wanted to get back to Las Rambla for some shopping. Of course the restaurant that we yelped with the great reviews didn’t exist when our taxis dropped us off, so we were left without any reference of where to eat. Luckily there are restaurants around every corner but the kids were tired, needed a bathroom and our choice had to be quick. We found Portic Boqueria, http://porticboqueria.com, for lunch. 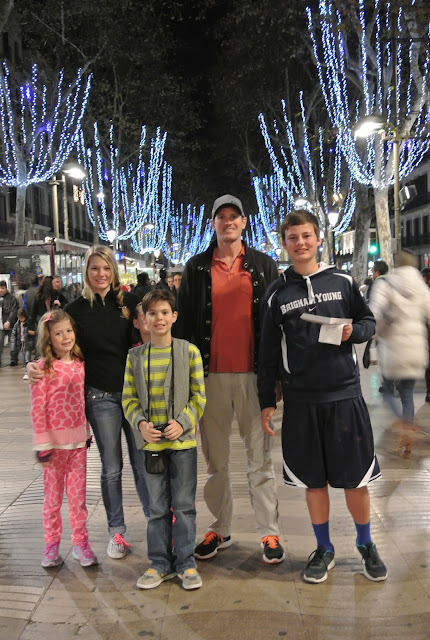 This was a funny experience because the menu was full of a very authentic Barcelona fare. Colton ordered a hamburgesa and soon the other children followed his lead. The hamburgesa was the only item on the menu they recognized. Clay and Lexi started their own protest and refused to order any food at all. I had a delicious tuna and sweet potato sauce but too much for me to finish. Trent of course ordered some kind of fried fish that came out with eyes and all. That was enough to ruin all of our appetites. While waiting for our food we began a round of twenty questions and laughed and laughed as Bella couldn’t hold her person a secret. She wanted us to guess who she was thinking of so badly she often gave very obvious hints so we could guess who she was thinking of right away. Finally our food arrived and the hamburgesa’s were more like big meatloaf patties with no bun. Colton played it off pretty smoothly and ate his food without a complaint which set a good example for the rest of the kids. Still Lexi and Clay held out not willing to eat a bite. Trent was ready to let them starve but since we were on Las Rambla, www.aviewoncities.com, where everything you could want to eat is located, I quickly spotted a Mc Donald’s and took them there after our meal. It was a five-story McDonalds and bigger than any the kids have eaten at in the states. 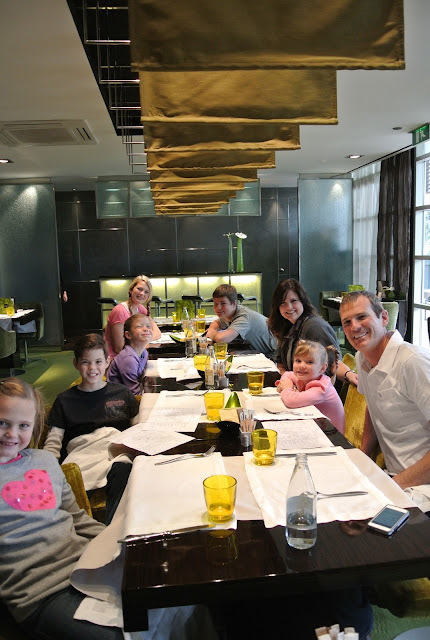 Even with four floors of seating there were no seats and we had to take the kids food to the outdoor patio located in the middle divider of Las Rambla to eat. By this time we were tired and ready to enjoy the hot tub at the hotel. Bailey and I had scheduled mani/pedis at the hotel spa and so we headed back to Hotel Arts. Our mani/pedi procedures were unlike any I’ve had in the US. This is one reason I love to receive these treatments abroad because it never seems to be the same as it is at home. When we arrived at the Six Senses Spa we were led back to the changing room to change into robes. I’ve never had to change into a robe for a mani/pedi so I was curious. Bailey was mortified to say the least, this was not her kind of relaxing experience. When we were led back to our rooms for our manis we were taken to separate rooms and told to lay down onto massage beds, luckily for Bailey we got to keep our robes on, and then we were made comfortable with lavender packets on our eyes and relaxing music in the background. I have to say it was the most relaxing mani/pedi I’ve ever received! I fell asleep quickly after chasing kids, and finding restrooms all day, and woke up to beautiful nails on my hands and feet. Soon we were led into a relaxing room that overlooked the ocean where we were given waters and asked to stay while our polished dried. 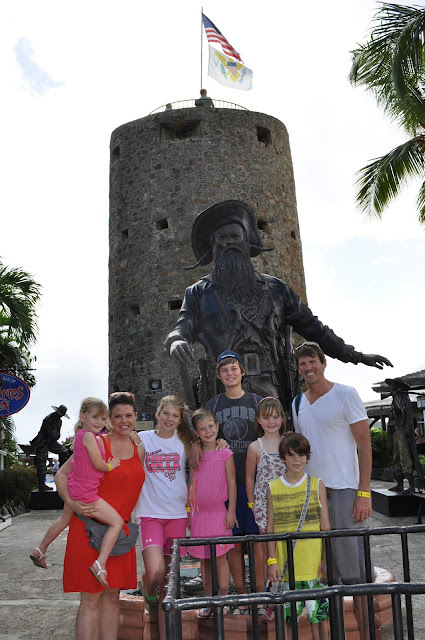 Bailey enjoyed the experience but still didn’t see why on earth we needed to be out of our street clothes. It was probably the most stressful mani/pedi she has ever had due to not being clothed. It was funny and memorable to say the least. Later that evening Trent and I went out one more time. 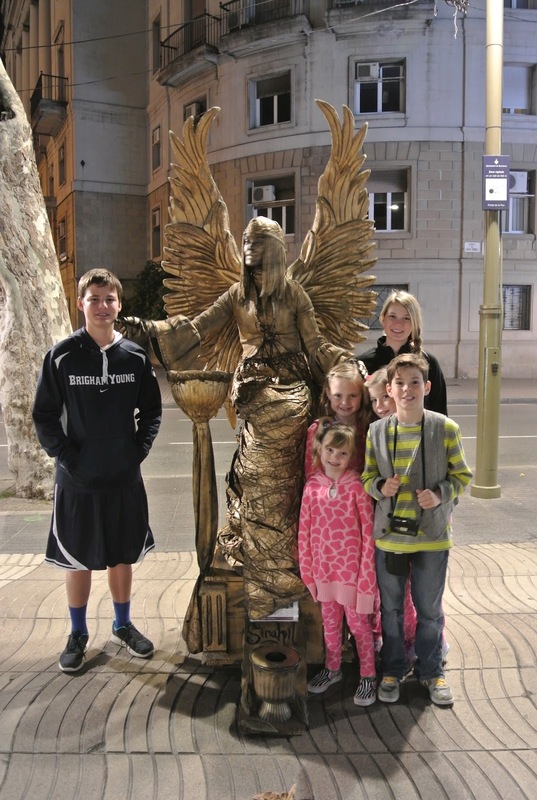 We needed to buy a few gifts and wanted to take my sister “L” and her husband “J” home a Lladro statue made in Spain. Since they had to take care of things back home including a huge water leak at our house I wanted to thank them for their trouble. When I asked our hotel concierge where we could buy a Lladro, lladro.com. I was surprised that she had never heard of Lladro before. It was funny that when I think of Spain I think of these statues, but for a Spanish national she had no idea what I was talking about. Soon she found a store online and we were off to Placa de Gracia to make our purchase. Placa de Gracia had every store I would have loved to shop, but unfortunately we were too late and most stores were closing. The street was lined with Marc Jacobs, Louis Vuitton, Miu Miu, Furla, Burberry, and lots of high end stores that I would have loved to roam around in had I not been on a family vacation. Instead I made a secret pact with Barcelona that I would be back and we would yet again pick up where we left off! Yay for Columbus! Looks like a grand ol’ time!